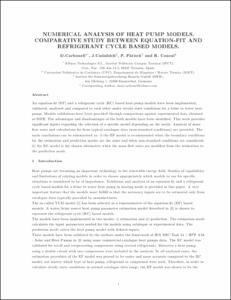 Carbonell, D.; Cadafalch, J.; Pärlisch, P.; Consul, R.
An equation-fit (EF) and a refrigerant cycle (RC) based heat pump models have been implemented, validated, analyzed and compared to each other under steady state conditions for a brine to water heat pump. Models validations have been provided through comparisons against experimental data obtained at ISFH. The advantages and disadvantages of the both models have been identified. This work provides significant inputs regarding the selection of a specific model depending on the needs. Analysis of mass flow rates and calculations far from typical catalogue data (non-standard conditions) are provided. The main conclusions can be summarized as: i) the EF model is recommended when the boundary conditions for the estimation and prediction modes are the same and when non-standard conditions are considered; ii) the RC model is the chosen alternative when the mass flow rates are modified from the estimation to the prediction mode. Carbonell, D. [et al.]. Numerical analysis of heat pumps models: comparative study between equation-fit and refrigerant cycle based models. A: International Conference on Solar Heating, Cooling and Buildings. "Solar energy for a brighter future: book of proceedings: EuroSun 2012". Rijeka: 2012.